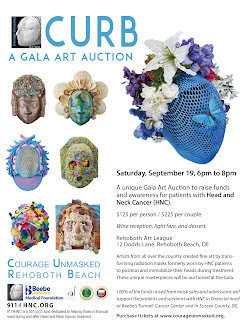 A unique Gala Art Auction to raise funds and awareness for patients with Head and Neck Cancer (HNC). Wine reception, light fare, and dessert. Courage Unmasked Rehoboth Beach is a silent and live auction to raise money and awareness for head and neck cancer (HNC). Artists from all over the country created fine art by transforming radiation masks formerly worn by HNC patients to position and immobilize their heads during treatment. These unique masterpieces will be auctioned at the Gala. 100% of the funds raised from mask sales and admissions will support the patients and survivors with HNC in financial need at Beebe’s Tunnell Cancer Center and in Sussex County, DE. The event is sponsored by: Beebe Medical Foundation, Rehoboth Art League, Village Improvement Center and 9114HNC.org. 9114HNC is a 501(c) 3 fund dedicated to helping those in financial need during and after Head and Neck Cancer treatment. For sponsorship opportunities, please contact Jonathan G. Willen and Associates, Inc. at georgina at jonathangwillen dot com or 202-248-7159.